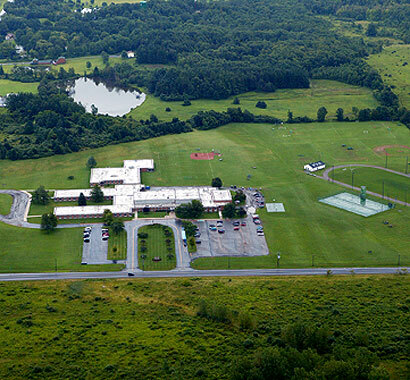 Campus CMG, as CM, managed the construction of the renovations and additions to Pembroke CSD. Work was performed at the following buildings: High School, Intermediate School, and Transportation Building. The High School received the following: site work, roof replacement, asbestos abatement, floor and ceiling replacement, complete renovation of all classrooms, new HVAC systems, handicap accessibility upgrades, lighting replacement, fire alarm system upgrades, interior door replacement, and renovated Auditorium, including HVAC and climate control. The Intermediate School scope included: Athletic field regrading, roof replacement, new HVAC, handicap accessibility upgrades, auditorium sound system upgrades, reconstruction of the building entrance for improved security, stairwell enclosure, lighting replacement, plumbing and fire alarm system upgrades. The Transportation Building scope of work included: parking lot reconstruction and oil separator replacement, roof replacement, handicap accessibility upgrades, bus lift replacement, lighting upgrades, and fire protection system.